This Raven 2 Altimeter is only 4.5cms (1.8") long and has 4 outputs. It is able to record a large amount of high-quality data and has all the features (and then some) you would expect from the most powerful flight computer on the market and it's less than half the size of others and at a great price. You can fly it right out of the box using the default redundant dual-deployment settings for the outputs, or use the easy-to-use Featherweight Interface Program to set up any staging or airstart events you decide to opt for. 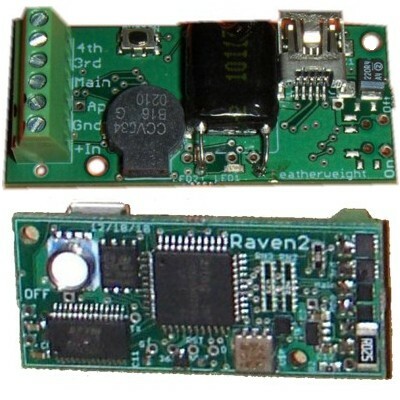 The Raven 2 has full functionality with either end up! Both visible and audible readout of individual channel continuity and battery voltage. 4.5cms (1.80") long x 2 cms (0.8") wide x 1.4cms (0.55") deep. 20 Hz Baro data, +/- 0.3% accuracy! 20 Hz for All flight events used for deployment logic. All of the above flight events are recorded at 20 Hz in the Flight Event Register, great for verification of the altimeter functions in test flights or simulated flights. A sophisticated built in test exercises all sensors and all outputs with a realistic simulated flight. Verify that your ematches work with your battery, verify your flight program, and view all the recorded data from your "flight" without leaving your computer.